Magnum G-Spring helps you lose fat, grow muscle and recover — all while you enjoy a deep, restful sleep. 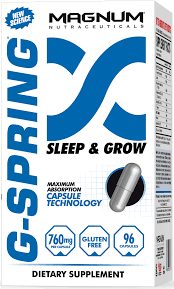 G-Spring is a multi-ingredient Pharmaceutical Grade formulation that increases your resting growth hormone levels while you sleep. This increase in growth hormone allows you to wake up feeling rested, energized, focused and — best of all — leaner and more muscular. Now you can train harder, recover better, burn fat more efficiently, and at the end of the training day, fall into a deep deep for improved recovery. Build while you sleep with Magnum G-Spring.